17th-century French red morocco gilt, in the style of Le Gascon, in red morocco gilt case. Purchased by J. Pierpont Morgan (1837-1913) in 1901. No. 653 in a (German?) 19th-century sale; purchased by J. Pierpont Morgan (1837-1913) in 1901; J.P. Morgan (1867-1943). 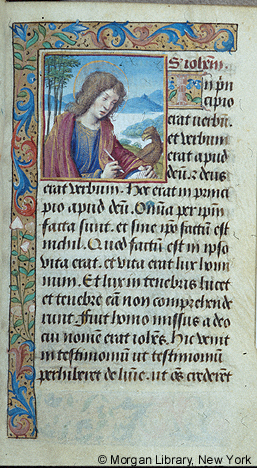 Ms. book of hours, perhaps for the use of Paris (Hours of the Virgin); written and illuminated in Tours, France, ca. 1490-1500. Artist: Workshop of Jean Poyer.